KIRKLAND, Wash., Aug. 24, 2017 – The Kenworth T370 is now available with factory-installed 18,000-pound and 20,000-pound front drive axles. The new offering is targeted for heavy utility services, construction, municipalities, fire and rescue, and other specialty applications. The Kenworth T370 offers the Fabco FSD-18A and FSD-20A front drive axles paired with an all-new Fabco TC-548 transfer case for exceptional durability. The two front drive axles are available with the PACCAR PX-9 engine rated up to 350 hp and 1,150 lb-ft of torque. Both models require taperleaf front springs, and are available with air or mechanical rear suspensions. 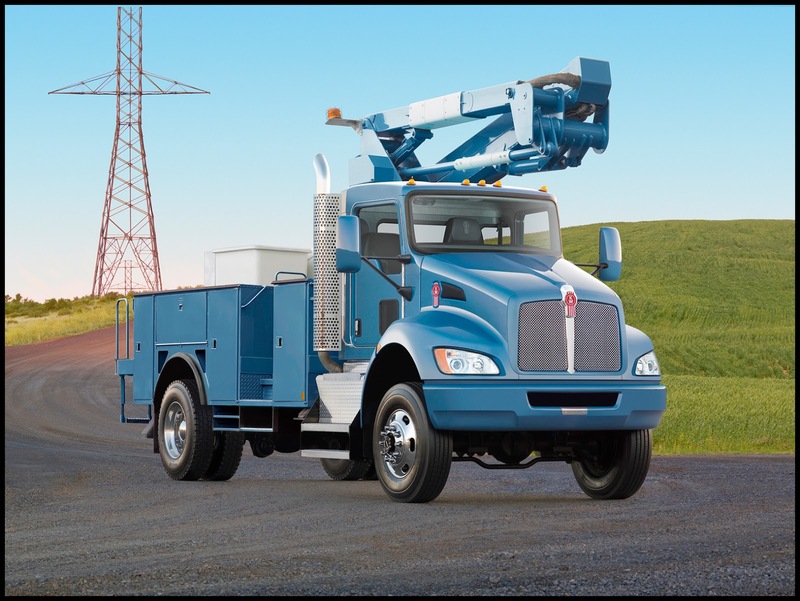 Kenworth has designed the front drive axle configurations with the lowest possible cab and frame heights. This allows easier body access and permits body builder boom installations to remain under most height requirements in U.S. states and Canadian provinces. In addition, the transfer case occupies frame space inside the rails from 36 to 52 inches behind back of cab, which provides clear space behind cab for body builder outrigger equipment. The transfer case includes an air activated front axle engagement switch and dash mounted indicator light, as well as a switch to control the high and low ranges in the transfer case. The T370 is available with a gross vehicle weight rating (GVWR) of up to 66,000 pounds, and can be specified with manual, automated or automatic transmissions. The Kenworth T370 is already available in 4x4 and 6x6 configurations with axle ratings from 10,000 pounds to 16,000 pounds.